Entries categorized "The Stamps of Life"
Our challenge for March 2015 has been issued by Jeanne Streiff! The challenge topic is Spring Bling! I chose to make cards using the recently released bicycle2stamp set, recently released by The Stamps of Life. In addition to the bicycle2stamp set, on this card I also used Eggs4Easter, which has that cute little chick and the grass. You'll find this month's challenge gallery on SplitCoastStampers using keyword CHXMAR15. We invite you to play along! Upload your project to your SplitCoastStampers gallery, add the keyword above, and your project will be automatically added to the gallery. Or join us on Facebook! Our challenge for February 2015 has been issued by Diane! The challenge topic is to Make a Valentine! I chose to make a simple Valentine treat bag using the cat2stamp set, recently released by The Stamps of Life. Such a fun kitty, that can be colored like your favorite feline. You'll find this month's challenge gallery on SplitCoastStampers using keyword CHXFEB15. We invite you to play along! Upload your project to your SplitCoastStampers gallery, add the keyword above, and your project will be automatically added to the gallery. Or join us on Facebook! Super cute snowman themed release from The Stamps of Life for October! I made a video to share my projects. Enjoy! 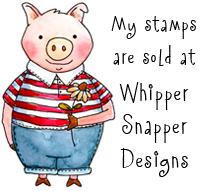 Today I am participating in the CardMaker Magazine and The Stamps of Life designer blog hop! The CardMaker Designers and The Stamps of Life Designers have teamed up to show you projects featuring stamps from The Stamps of Life. My card features images from several stamp sets including Froggy2Love,Tea4Two, Spooky2Scare, Gum4Backgrounds, and dies from the Birthday4Cookie, Froggy2Love, and the Sizzix Snowglobe stamp/die set, by Stephanie Barnard. Visit and comment on each of the blogs participating in today's hop. One winner will be randomly chosen to win 3 stamp sets of their choice ($12.95 value or less)! The winner will be chosen July 31st and announced on The Stamps of Life Blog on August 1st. Now, get yourself a good dose of inspiration and check out the other designer projects! We are about to get our first triple digit day, and it really makes me wish for a day at the beach. Any beach. And I think the seastar die from The Stamps of Life is just about the cutest seastar shape I've seen. Our challenge for May 2014 has been issued by Kelly! The challenge topic is Causing a Scene - to make a spring/summer scene card or project. I used recently released stamps and dies from The Stamps of Life to create this beach scene. My favorite part of this card are those little sea star die cuts! So CUTE! You'll find this month's challenge gallery on SplitCoastStampers using keyword CHXMAY14. We invite you to play along! Upload your project to your SplitCoastStampers gallery, add the keyword above, and your project will be automatically added to the gallery. Or join us on Facebook! The current High Hopes challenge is Clean and Simple. I chose to use Rosie's Ride and Herbie's Heifer for my card. Instead of using the entire images, I used only Rosie and Herbie and cut them out from the paper they were stamped on. This allowed me to add them to the window I die cut in the front of my card! I embellished the card with a flower I made using an EK Success flower punch and Spellbinder leaves I die cut from card stock. I added a pretty cocoa colored button to the center of the flower that I threaded with a thin strip of card stock. 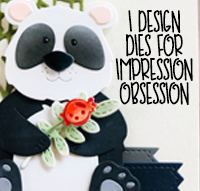 The sentiment is from my Everyday Sentiments cling mount set, from Whipper Snapper Designs. I used Banners #2 die from Sizzix to create the two banners on the card. The cute farm themed paper is from StudioG, but similar prints can be found manufactured by JilliBean Soup. Sorry for the lack of activity here over the past few days ... we had some serious internet issues going on, and our life online came to a screeching halt. Thankfully, things seem to be back up and running today. While we have connectivity, I thought I'd share a couple of cute ladybug cards I made! This card was made using various dies from The Stamps of Life, and a Sizzix label die -- and if you can believe it, not one single stamp! The ladybug was made using the ladybug die set from The Stamps of Life. I die cut cute papers and assembled her, adding a button and string for embellishment. The little tag is from the MiniTags2Stamp stamp and die set, also from The Stamps of Life. And the heart is from a Sizzix stamp/die set called Love, Hugs & Hearts. Such girly colors! This card was also made using stamps and dies from The Stamps of Life. The sentiment is from the Ladybugs2Love stamp set, and the dotted trail is from the Bee4Me stamp set. I created the ladybug using the same ladybug die set as the first card. Cute papers from October Afternoon make this card extra sweet. And I added a cute little pink gem to the top of the ladybug's wings. I hope where ever you are, you are having a lovely day. Here the sun is shining, and it's just a beautiful day! The Stamps of Life recently released some mini banner dies that coordinate with several of their stamp sets. Here are a few cards I made using the dies. This busy country kitchen themed card uses papers from Farm House. I love the small little recipe cards that are included in the 6x6 paper pad as cut-aparts. So cute! This Valentine was quick and easy to put together. I think the most time consuming part was tying those little bows on the back of the buttons. Patterned paper from Crate Paper, along with the dies, did all the work for me! Yay! And here's another sweet Valentine-ish card using felt instead of paper for the banners. Another quick and easy card. 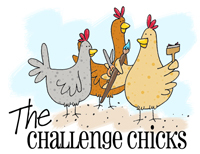 Our challenge for March 2014 has been issued by Jeanne! The challenge topic is Spring Flowers! I used the recently released Crazy4Daisies set from The Stamps of Life to create this totally wild floral card! For the leaves behind the flowers, I used the Leaves stamp/die set from Sizzix. You'll find this month's challenge gallery on SplitCoastStampers using keyword CHXMAR14. We invite you to play along! Upload your project to your SplitCoastStampers gallery, add the keyword above, and your project will be automatically added to the gallery. Or join us on Facebook! Here's a sweet little Easter card I made using stamps and dies from The Stamps of Life. I stamped the bunny and bow on Neenah cardstock and cut the images out with scissors. I added lots of pretty die cut eggs and mini flowers, too! The printed chocolatier paper in the background I thought was perfect ... it's from my stash ... sorry, I can't remember which paper line! There are some fun new mini flower dies available at The Stamps of Life, and I thought I'd share a few of the projects I made using them! For this card, I used the new mini flower dies, along with the onesie die, which is just so cute! For a splash of color, I used pink brads for the flower centers, and little sage green and silver sparkly leaves tucked under the flowers. On this card, I hand cut a large fishtail banner and added a paper doily to the top of the card. The flowers are cut from yellow and peach colored card stock. I added a few green leaves behind the flowers as well. I adhered a few clear gems to the flower centers for a little sparkle, and a cute pink button to the center of the white string bow. For a third card, I used the Sizzix fancy #4 labels die set to create a pretty center frame using super sparkly silver glitter paper. The mini flowers are cut from various colors of card stock, with clear gems adhered in the centers. Oooh la la! Check out the mini flowers gallery on The Stamps of Life website for more inspiration. Sorry for the long delay in blog posts! I didn't realize it'd been so long! Sheesh! I'm up to my eyeballs in holiday projects, glue, glitter, wrapping, packaging, addressing, stamping, and trying to get things ready for the mail before I leave next week for the great, COLD, hopefully snowy, northwest. It's amazing how having 6 fewer days between Thanksgiving and Christmas puts a wrinkle in my project list! I've gotten more use from the holly Embosslit from Sizzix this year. Such a great size, and I love that it cuts and embosses at the same time! All stamps and dies from either The Stamps of Life or Sizzix. I have a fun project to share today! Sizzix released Stand-Up card dies, which cut and score a 5.5" square card base. What's neat about the Stand-Up dies is that they have a center cut shape that makes for a very fun, folded card. I put together this cute seasonal project using the Circle Stand-Up card for the base of my project. This particular Stand-Up card has a half-circle die cut center. When folded on the score lines that are created when you die cut the card, the card's special center cut stands upright. Here is a view of the backside, so you can see how the card is cut and scored. There's even a little "kick stand" type cut in the card base to hold the card upright as shown. Let me show you how I completed my project. First, I die cut the base of my card and all of the shapes and parts I thought I would need for my card. I cut lots of pumpkins and leaves, knowing that I could always save the pieces I don't use on this project for future projects. I cut two birch colored trees and two black trees. I also stamped out the images I knew I would want to use, giving me space to cut them out as planned. I adhered the trees together, as shown. I off-set them just a bit, so the black trees were just barely showing from behind the birch colored trees. Not only did this give the birch colored trees a nice shadow effect, it also provided a bit of stability to the trees. I adhered the circles together, giving the yellow circle a nice orange border. Using a long blade scissor (a pair of scissors I've had for eons! ), I cut some gentle hill shapes from a light green paper. I used my tracing wheel to add a detail line along the top edge of each shape. I adhered the three hill shapes together, lining up the outside edges and corners nicely. I adhered the sun to the Stand-Up card base, and then adhered the light green hill panel over top of the sun, being careful to match the edges and corners to those on the card base. I adhered the trees in place, overlapping the branches slightly, and off-setting the base of the trees. Once the stamped images were colored and cut out, and the pumpkins had a bit of tracing wheel detailing, it was time to create the scene! I started by adhering a couple of pumpkins in place, and then adding the small raccoons so that when I added more pumpkins to the scene, they would look like there were popping out of the pumpkin pile to say hi! I added more and more and MORE pumpkins, using white glue, and even some foam adhesive when I wanted pumpkins to pop up a bit from the ones behind. I also added a couple of apples to the pile as well. I added the large raccoon to the corner of the card with foam adhesive, for a bit of dimension. Using paper snips, I trimmed off the excess parts of the stamped image so it matched the edge of the card nicely. Next, I added leaves to some of the pumpkins for a bit more color and interest. You can see the tracing wheel detailing I added to the pumpkins. I do love my tracing wheel! Finally, I wrapped the front of the card with twine, tied a bow, and added a cute little brown button. Here you can really see the dimension of the card front. Foam adhesive is a great, and easy way to add a lot of dimension and interest to your projects! The backside of the finished card shows the trees popping up beyond the edges of the sun and the special center cut of the card base. The inside of this card would be fun to decorate, too! I'll probably do that when I send this card to someone, to say Hi! I finished the Halloween treat toppers! The bags are entire pound of fun gummies of all sorts! The ghost image is from The Stamps of Life Spooky2Scare stamp set. The sentiment tag was made with small little stamps I bought at Michael's a few years ago. The topper was made with an ornate label die from Sizzix/Stephanie Barnard (cut and then scored and folded down the center), and a couple of Spellbinders circle dies. The back of the topper has a list of creepy treats Alan and I dreamed up. Don't they sound delish!? Each thing on the list is represented by a different kind of candy in the bag. Oooooh, gooey fun! I also put together a basket of goodies, including one of the big candy bags, one of my Halloween Pencil Treats, and a cute little Halloween notepad I bought earlier this month. The basket is a wooden berry basket that I painted black and dressed up with holiday papers, tulle, buttons, and twine. If you'd like to see the video I made where I share the toppers and a few other Halloween projects, here you go! If you have trouble viewing the video here on my blog, you'll find it on my YouTube channel. Here's a peek at some Halloween goodies I've been working on... I plan to do a quick video about these and will post more photos as well, but wanted to give a peek at the progress. Spooky-Fun!! The Stamps of Life recently released a cute train stamp set. I put together this colorful and cheery card using the engine, a train cart, and the number 6 from the coordinating numbers stamp set. I created the scene using various layers of cardstock, using two different greens for the hillsides, and black for the tracks. The cloud paper is from the Here+There Studio Calico 6x6 paper pad. It worked pretty well to help create the scene! The images were stamped on Neenah cardstock with Memento ink, cut out, and colored with Touch Twin markers. I think this card turned out pretty darn cute! And, if you enjoyed my crafty goodies video last week, you might enjoy the follow-up video... yup, a few more goodies to share! If you're having trouble viewing the videos here on my blog, you can check them out on my YouTube channel. A Monday off work is the best Monday of all! The Challenge Chicks: Die Cuts! Our challenge for September 2013 is being shared today! This month's challenge is to use Die Cuts on your project! I chose to use several on this project to create a fun Christmas card with a bit of a country feel. First, I die cut a window on the front of my card using a framelit die from Sizzix. Then I created the light using the light background and light parts dies from The Stamps of Life. I "hung" the light across the window using hemp cord attached to the sides of the window with buttons. The sentiment banner is also a die cut that I added faux stitching to, and decorated with a cute brown button. And finally, you'll find this month's challenge gallery on SplitCoastStampers using keyword CHXSEP13 . We invite you to play along! Upload your project to your SplitCoastStampers gallery, add the keyword above, and your project will be automatically added to the gallery. Or join us on Facebook! Good morning! The Stamps of Life girls are blog hoppin' today with the Clearsnap designers, and I have a couple projects to share with you! My first project is a cheerful swamp scene. I stamped three frogs and die cut them with the coordinating framelit die. I colored them various colors of green and added dots for extra "cute" factor. I adhered the scalloped layers (the water) to the card by only adding adhesive to the outside edges and the bottom of the layers, leaving the center area of the layers unattached. I placed the frogs between different sections of the scalloped layers with foam adhesive for even more dimension. The sun in the background is actually a snow globe die cut from a Sizzix set that was just the right size for the sun. And the clouds are from another Sizzix set called Kites. I stamped the sentiment on a small banner and attached the banner to one of the clouds with a brad. I think this card turned out so very fun! The second project I have to share is this "better late than never" snail card. To create the hillside, I pulled a celery colored ink pad across the paper several times, in both directions. I added some faux stitching lines to enhance the suggestion of hills. The balloons are stamped in various shades of ink, and die cut using a coordinating framelit die. The snail was stamped on a separate piece of paper, colored, cut out with paper snips, and adhered to the card with foam adhesive. I added a charming "slime trail" behind the snail with Sprinkles! glitter. I think the purple card base adds extra cheer, don't you!? If you'd like to start at the top of the blog hop, head on over to the Clearsnap blog. Or, you can make your way through the below list of hop participants ... and have FUN! Oh, and, you might want to leave comments as you go -- I hear there is a fantastic prize being awarded to one lucky reader! Details about the give-away can be found on the Clearsnap blog. The Stamps of Life just released a fun pumpkin stamp set, and I have completely had a blast working on fall themed cards. It is a nice mental escape from our dreadful summer weather. This card is quick and easy, that's for sure! Yippee, for Fall projects! They just make me feel good! The Stamps of Life recently released a hexagon background stamp that coordinates nicely with their bee stamp sets. I put together a couple of cards using hexagon stamped paper as an accent to cute die-cut bees. I also used Sprinkles glitter on the wings of the bees, which gives them great sparkle and shine! If you're a fan of actual glass glitter, Sprinkles glitter is the best alternative to small glass shards I've seen! And you know I'm a fan of glass glitter -- especially at the holidays!! High Hopes Challenge: Thank You! The current High Hopes challenge topic is Thank You! How easy is that!? You could choose to do a teacher themed thank you card, or just a general "thanks" card for anyone will do! Here's a quick and easy graduation themed project for grads you may know! This would be easy to customize with the graduate's school colors, too! The cute tag die is from The Stamps of life... along with the bitty scalloped circle, and sentiment, too! Want the dimensions for the pencil box? Check out my Pencil "Treat" Box template. The Stamps of Life recently released a framelit die that coordinates with their Cars2Drive stamp set. I've been having a ball making projects with it! The cards I've made are a bit bolder, more graphic, then I tend to make when I'm using my own illustrations. And I love the variety The Stamps of Life produects allow me in my creativity! Not only is using the die cut car fun, but using the negative space of the die is also great! Here I used the negative space of the die to create a heart filled beetle. I used a sentiment from Ladybugs2Love stamp set -- a perfect companion for the car die, I think! I also made this clean and simple card using just a red die cut car, a heart, and a sentiment. I love how it turned out! I used my seamstress tracing wheel to create some faux stitch lines for a bit of visual excitement! I enjoy the variation these types of products allow me in my craft time! It's a nice departure from colored line art! The Challenge Chicks: Color Challenge! Our challenge for May 2013 is being shared today! This month's challenge is hosted by Diane and she chose to host a color challenge! For my project, I chose a beautiful floral patterned paper by Crate Paper. It contains all the necessary colors for the challenge, which helped the rest of my card come together quickly! And finally, you'll find this month's challenge gallery on SplitCoastStampers using keyword CHXMAY13 . We invite you to play along! Upload your project to your SplitCoastStampers gallery, add the keyword above, and your project will be automatically added to the gallery. Or join us on Facebook! Paper: Neenah, October Afternoon, Stampin' Up! Care to see the card? I used the ladybugs2love from The Stamps of Life set to create this card. The "path" of the ladybug was created using twine. I used a small glue pen to tack the twine down in a couple of spots. Photobombing is hard work. Must. Nap. Zzzz. For this card, I fussy-cut the stamped ladybug and added it to the card using foam adhesive. I thought the pink twine was so cute on this card! Paper: Neenah, Bazzil, October Afternoon, Stampin' Up! Yup, you really are! I put together this card using the rest of the emboss resist panel I made the other day. A clean and simple design. I just love how the watercolor paper absorbed the color sprays! So fun, and uncontrolled! I packaged the card in a glassine envelope and topped it with a pretty paper doily. I made a little white and yellow felt flower embellishment to decorate the baker's twine bow I wrapped around the envelope to keep the doily in place, and finally, I added a small tag with the recipient's name written on it. When I saw the gum4backgrounds stamp from The Stamps of Life, it immediately made me think of a fun technique called emboss resist. So, I thought I would use the large background stamp to share with you a photo tutorial on how to do the emboss resist technique using the Stephanie Barnard color sprays. Here is a detail photo of the panel I created using the emboss resist technique. Let me show you how it's done! The supplies you'll need are watercolor paper, embossing ink, embossing powder in white or clear, water, several color sprays, a waterproof craft surface, a heat tool, and of course the stamp. Start by embossing the stamp image onto watercolor paper using embossing ink and an embossing powder. You can use white or clear embossing powder, or even a clear based irridescent powder. The powder I chose is irridescent and has a bit of sparkle to it as well. Beautiful, and really adds to the "bubble" look of the stamp image. Spray your waterproof craft surface with a couple of spritzes of each spray color, overlapping them slightly, but not completely. I chose to use two different blue sprays as well as a bit of purple, for a nice complimentary color palette. Spray water onto the colors until your colors start to form slightly larger pools of color. Next, lightly spray the embossed side of your watercolor paper with water. This step preps the paper fibers for absorbing the color sprays. Once your paper is dampened with water, set your watercolor paper (embossed side face down) into the pools of color. Press the paper onto the crafting surface so you get color on the entire surface of the paper. Lift the watercolor paper from the crafting surface to reveal the color. You can see how the embossed area resists the color, and leaves you with a beautiful pattern. Using a heat tool, dry the watercolor paper to set the ink colors. If you like the results, you can be finished with the coloring stage... or, you can take it a bit further! To add more color, tap the dried paper down into the remaining pools of color, adding a random assortment of spots to the surface of the paper. Tap randomly, into big spots and little spots. When you're happy with the additional splotches, heat set your paper again to dry the ink. You can repeat this process until you're happy with the results. The Stephanie Barnard sprays have wonderful, intense color payoff, and blend together beautifully! I was thrilled by how they took to the watercolor paper. I trimmed my dyed paper to size and assembled my card. One more thing ... you could simply clean up your craft surface with paper towels, but don't let that left over color on your craft surface go to waste! Use the left over color to make hand dyed ribbon! This is white seam binding ribbon that I used to wipe up my crafting surface after I was finished coloring my paper. Once I had the ink all wiped up with the ribbon, I gave the ribbon a couple spritzes with water to help soften the edges of the inks, and then set the ribbon aside to dry. Now I have some beautiful hand dyed ribbon to use on future projects. I hope you try out this technique. It's super easy, and so FUN to watch the color transform the white paper (and ribbon!) into a beautiful, one of a kind, surface. Thought I'd share this cute little Easter / Spring card with you today! Ink: Black Memento, Sand Memento, Dusty Durango by Stampin' Up! The Stamps of Life has a "sweet" new set available today! I chose to make this card using bright, cheery colors with black for my accent color. I coated the gumballs with chunky glitter, and ooooh, do they sparkle! Stamp: The Stamps of Life "Bubblegum4Me"
Over the years I've made LOTS of felt flower brooches for the Christmas holiday, usually in pretty reds, creams, or blues. But last night I thought I'd make a nice springy yellow flower pin. I used Sizzix framelits dies to cut the flowers and leaves out of wool felt. Once cut, the layers were sewn together with needle and thread, which also holds the vintage mother of pearl button in place. I pinned the finished flower (I sewed a lapel pin on the backside) to a tag I cut using a Sizzix Bigz tag die. The tag is a piece of printed paper adhered to thin chipboard for added support. The sentiment banner and flowers were cut using Banners #2 Framelits by Sizzix. I think this will be a fun gift to give to a friend! Ink: Stephanie Barnard Colorbox "Grape"
Earlier this week I posted this "four cute chicks" card and wrote about how I was able to create the various body shapes for the chicks. Since then, I've had several questions and requests for more details on how I was able to create the various body shapes using the same stamp, so I thought I'd put together a quick "how to" in photos. Hope this is helpful! For my supplies, I'm using the Eggs4Easter set by The Stamps of Life, a clear block, an image mask (made from a sticky note), and ink for stamping. What makes this shape changing technique possible is the unique way the chick stamp was made. The center of the stamp is not filled with polymer, which allows it to be shaped differently than it's original shape. If the stamp's center was filled with polymer (like most clear stamps are), it would not be possible to change the chick's shape. Place the chick stamp on a clear block, ink the image, and stamp the chick in it's original shape. Also stamp the chick on a sticky note and cut it out to create the image mask needed for the next steps. Adjust the shape of the chick on the clear block and ink it for stamping. See how the open area in the center of the chick's body allows the reshaping? If this area was filled in with polymer, the body shape would not be able to be changed. With the sticky note mask placed over the first stamped image (mine is white with a red and yellow dot), stamp the second (taller) chick in place. By covering up the first stamped image with the image mask, you are preventing the ink of the second image from overlapping the first image. Once again reshape the stamp on the block. This time make him shorter and, well, plumper! Again, it's that open center of the image that's allowing it to be reshaped. With the mask still in place over the first stamped image, stamp the third chick in place. Remove the mask to reveal your grouping. Finish building your chicks with other stamp images provided in the set, masking as needed. I masked their bodies while stamping the legs, so I could adjust the length of the legs and not risk getting ink in their bodies. On my original card I used this technique to stamp an original shaped chick, two tall chicks, and added a fourth plump chick that was stamped on a separate sheet of paper, cut out, and adhered to my card using foam adhesive for a bit of dimension. While it's not always possible to reshape stamps like this since most of the time the centers are filled edge to edge with polymer, keep your eye out for possibilities of when you can! Sentiments are easily changed from straight lines to curves, so keep that in mind, too! Ink: Black Memento, Antique Linen Distress Ink by Ranger, Dusty Durango by Stampin' Up! A quick and cheerful spring card to share with you today! I made this card using the little fuzzy chick image from The Stamps of Life Eggs4Easter stamp set. The chick in the middle is the "true" shape of the stamp. Because the belly of the chick stamp is open (the stamp's clear polymer doesn't completely fill the center of the stamp), the stamp can be shaped a bit, allowing for the chick to become taller, shorter, thinner, fatter! To create this grouping, I stamped the original chick once, put a post-it note mask over it, reshaped the chick stamp, and stamped the chick a couple more times. Such a fun and easy way to create a group! It was so fun being able to give a bit of shape to these chicks! Once I had them stamped, I colored them with Touch Twin markers and added a bit of grass around their feet with a Prismacolor colored pencil. The little fatty in the front was stamped on a separate piece of paper, then cut out and adhered to the card using foam adhesive. This makes him pop out a bit from the others, and really say hello!